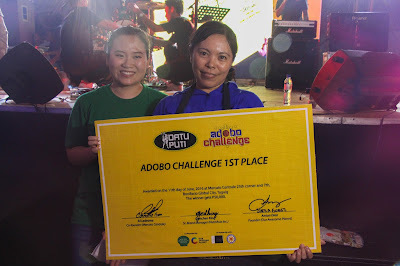 NutriAsia's Dati Puti merged with Our Awesome Planet and Mercato Centrale to present the Datu Puti Adobo Challenge to take the Datu Puti Adobo Movement to the next level. The Datu Puti Adobo Movement was created last year and its mission is to push adobo to become our pambansang ulam. It is a movement that has been recognized my important people especially when Bohol First District Representative Rene Relampagos filed House Bill 3296 to formally declare it as the national dish. The Adobo Movement has supported the bill by launching a petition here. For the Datu Puti Adobo Challenge, each Mercato vendor was tasked to create its own Adobo dish. They were tasked to combine any Adobo dish with at least two of the three Datu Puti main products: vinegar, soy sauce and fish sauce. 14 entries were selected and were based on various criteria including taste, creativity and the use of Datu Puti products. 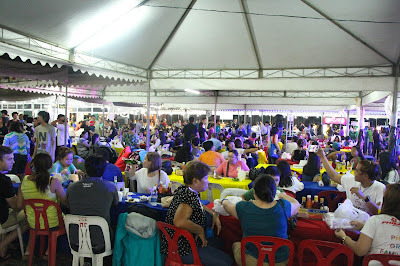 Located at 7th avenue and 25th street, Mercato Centrale is the right place to host the Datu Puti Adobo Challenge. Ever since it started as a food market every Friday and Saturday from 6PM to 3AM, Mercato has become the destination for urban foodies for its variety of delicious choices. Each vendor has been carefully selected by the founders of Mercato, RJ Ledesma and Anton Diaz. Foodies were given a chance to become judges by sampling the Adobo dishes of the 14 finalists. Each judge can vote for 3 merchants who they think had the best Adobo dish. At the end of the night, the results were revealed and there were an overwhelming amount of people who voted. The event was hosted by Pop Talk's Tonipet Gaba and the festivities were brought to life by musical performances from Up Dharma Down and Ebe Dancel. At the end of the night, The Oinkery won 1st place, Dayrit's won 2nd place and Bakmi Nyonya won 3rd place. The Oinkery's slow cooked Pugon-smoked Pork Adobo glazed with rich Cebu style sauce with fresh mangoes on the side won the hearts of foodies. Dayrit's Pork Adobong Laing Pinangat came in a close second as it combined two popular Filipino dishes in adobo and laing. Bakmi Nyonya was able to combine Indonesian style cooking with Babi Kekap Adobo Nyonya as it is the classic Filipino Adobo we have grown to love infused with Indonesian spices. Not to be outdone, Lariza's won the People's Choice Award for its Seafood Adobo featuring crab, shrimp and mussels cooked Adobo style topped with cheese. What about you? Do you agree with making adobo the country's national dish? Will you sign the petition and join hundreds of Filipinos pushing for it at adobomovement.com? Who does not like Adobo? It is great with anything.